Dr M. S. Prathibha is an Associate Fellow at the East Asia Centre in IDSA. Her research interests include China’s Nuclear Policy, Strategic Force Modernisation, Chinese Views on War and Strategy, Chinese Foreign Relations and Chinese Civilisation and Philosophy. Currently, she is working on Missile Defence and China. 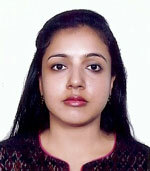 Dr Prathibha is a Member of the Editorial Board of Strategic Analysis (Routledge). She has published in journals in Strategic Analysis (Routledge), China Report (Sage), and various international publications. She had received the Human Resource Development (India) and China Government Scholarship and completed her fellowship at the School of Political Science and International Studies, Beijing Normal University from 2009-2011. She had also conducted field trips to China in 2015 and 2016. Dr Prathibha had completed her PhD at the Chinese Studies Division of East Asia Centre in School of International Studies, Jawaharlal Nehru University. Dr Prathibha did her Masters in International Studies at Stella Maris College, Chennai. She won the Best Dissertation Award in her Masters. She did her Bachelors in Mathematics at Ethiraj College for Women, Chennai. Associate Fellow, IDSA, Dr MS Prathibha’s article on India-China relations titled ‘Perceptions and Misperceptions in India-China Relations’ was published in the Op-Ed/Art section of East Asia Forum on October 20, 2017. Associate Fellow, IDSA, Dr MS Pratibha’s analysis on the contest between India and China over Myanmar, titled ‘India and China’s Contest for Influence over Myanmar’ was published in ‘The Kootneeti’ on October 4, 2017. Associate Fellow, IDSA, Dr MS Pratibha’s chapter on CPEC titled ‘China-Pakistan Economic Corridor’ was published in ‘One Belt One Road: China's Global Outreach’, edited by Srikanth Kondapalli and Hu Xiaowen. The leadership transition in the Rocket Forces shows that the service is not only integrating with other services but that its officials are increasingly called upon to other services to facilitate joint training and exercises. Even if China has not stated that it cannot settle the border question with India in the immediate future, its actions certainly hint at its preference for border peace and control over an early resolution. Associate Fellow, IDSA, Dr M S Pratibha wrote a chapter on India in the book ‘Global Expectations for Korean Unification’ by Kyuryoon Kim et al. The book was published in December 2014.